A performance by a Vienna orchestra in Tirana has triggered criticism of Albanian President Edi Rama, with opponents arguing that more focus should be placed on local artists. 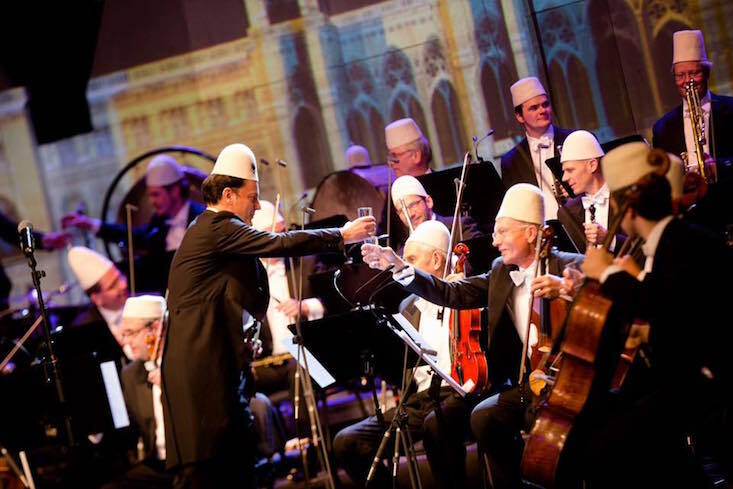 Monday's concert saw 36 musicians from the Vienna Philharmonic Ensemble, led by Albanian violinist Shkelzen Doli, perform wearing the traditional Albanian qeleshe cap and making toasts with local raki. “Albanians know how to drink raki better and qeleshe look better on their heads,” said MP Petrit Vasili, who leads the parliamentary group of the junior party in Mr Rama's ruling coalition, the Socialist Movement for Integration. Mr Vasili criticised the Albanian Ministry of Culture for coughing up more than 100,000 euros ($106,000) in fees to concert organisers, arguing that local musicians could have performed just as well for less money. Not everyone has been quite so critical, however. The culture editor at Shqip magazine, Alda Bardhyli, voiced praise for Mr Rama's plans to bring more European culture to Albania, which also include an upcoming exhibition of Italian art. “There has been criticism of how the Vienna Philharmonic Ensemble [concert] was organised in Tirana, but it should be seen as an attempt to put Albania on the map of European culture,” she said in an interview with Balkan Investigative Reporting Network, adding that such events allow Albanians to access cultural works normally only possible to see abroad. Nonetheless, Ms Bardhyli also commented that the government should invest more in the local arts scene. “It is urgent to invest more in cultural policies in the country, and there is a big need to do so when it comes to the visual arts,” she stated. The orchestra controversy is set against the backdrop of a long history of underinvestment in Albania's local arts scene by the government, and disgruntlement in the artistic community. In August 2016, the director of Albania's National Theatre of Opera and Ballet, Ilir Kerni, resigned over a lack of funding for the theatre.